Recycle Bin Deluxe. Finally you get the Recycle Bin special folder in XYplorer as well. The real path/name for each item is displayed in a separate column "Recycled Name". Ctrl+P will copy that info to the clipboard. 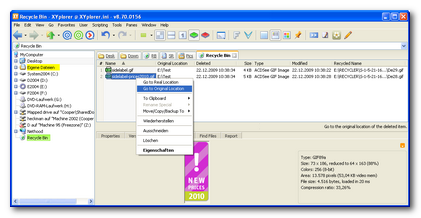 The context menu's custom command "Go to Real Location" will beam you to the real location of the item and select it in XYplorer's raw recycle bin view. The context menu's custom command "Go to Original Location" will beam you to the original location of the item. You can open (Enter, Dbl-Click) a deleted folder to browse its contents. You can show the recursive folder sizes of deleted folders right in the list (as usual in the Size column). You can see the Space Used or Real Size of deleted items (Explorer shows only Space Used). You get the exact time of deletion down to the second (Explorer only tells you the minute). Apply Visual Filters to the Recycle Bin. Sort folders separately from files. Color code items in the Recycle Bin just like normal files. You can hide the Recycle Bin from the tree. And, last not least, it's faster. Edit Mini Tree. 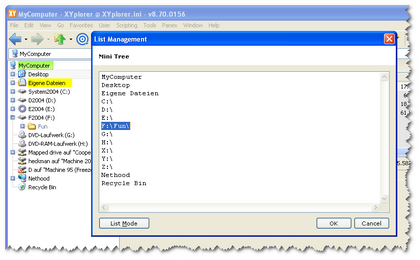 Now you can directly edit XYplorer's famous Mini Tree. Add the branches you need to see and delete what's just in your way. 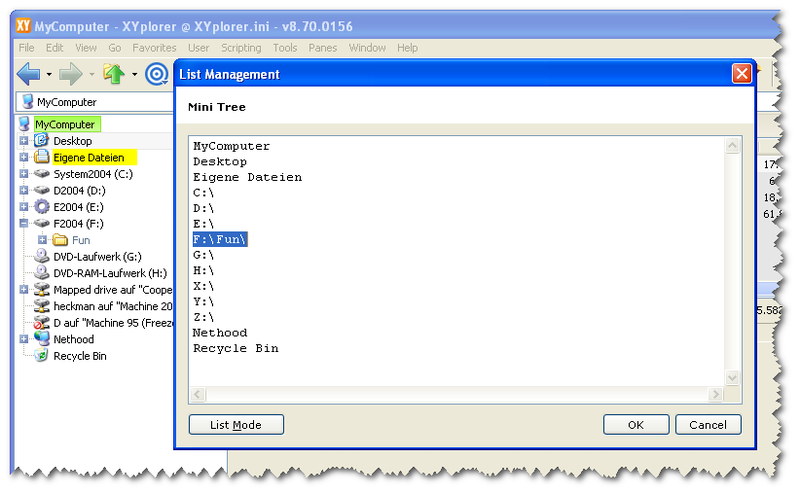 If you don't know the Mini Tree yet: This is not about creating or deleting folders. It's just about which of the existing folders are displayed.